I’ve long been a fan of shanks of most any animal (pork, deer, lamb, beef etc) because it is one of the more unique tasting cuts. Even beef shanks are often described by pedestrian eaters as being “Gamey.” In most people’s minds, “gamey” tends to be a description that has a negative connotation, so, in the case of shanks, I think that “earthy” or “musty” might be a better description since those adjectives tend to be non conclusive. I hardly think that “gamey” is a bad thing and, in fact, don’t think that most people who use that word have any idea what they actually mean when they saw it, but I digress. Being slow twitch muscles that take a constant workload and, in the case of wild animals such as deer, the shank takes a tremendous workload jumping fences, outrunning coyotes, fighting other bucks, travelling great distances and eluding hunters. Because of these demands, the shank is full of silverskin that compartmentalizes the slow twitch muscles. Silverskin will breakdown during the cooking process, but it takes awhile. All of the collagen combined with the inherent robust flavors of slow twitch muscles produces wonderfully complex and rich flavors that are both earthy and even a bit musty. I started with this large shank from a mature buck. 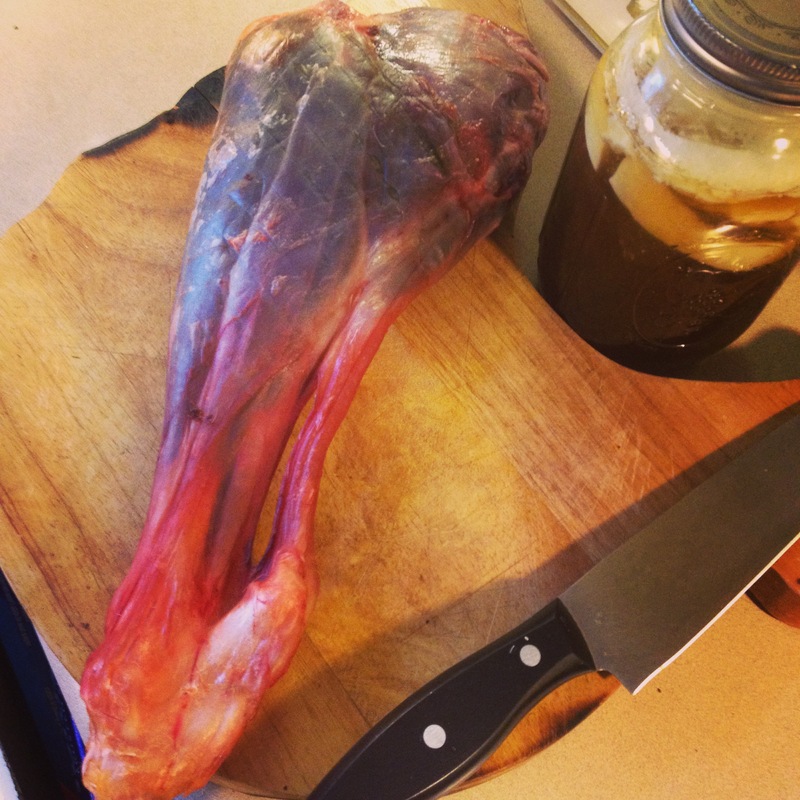 I often see hunters removing achilles tendons, but they are full collagen and I highly recommend adding them to the pot. I sawed the bone in half near the bottom so that the shank would fit in the pot and so that the bone marrow could escape and make its flavor and fat contributions. I then proceeded to brown the surface of the shank on all sides. While this was going on, I sauteed root vegetables: Garlic, Onion, Carrots and Celery in butter (salt & pepper) in a dutch oven. 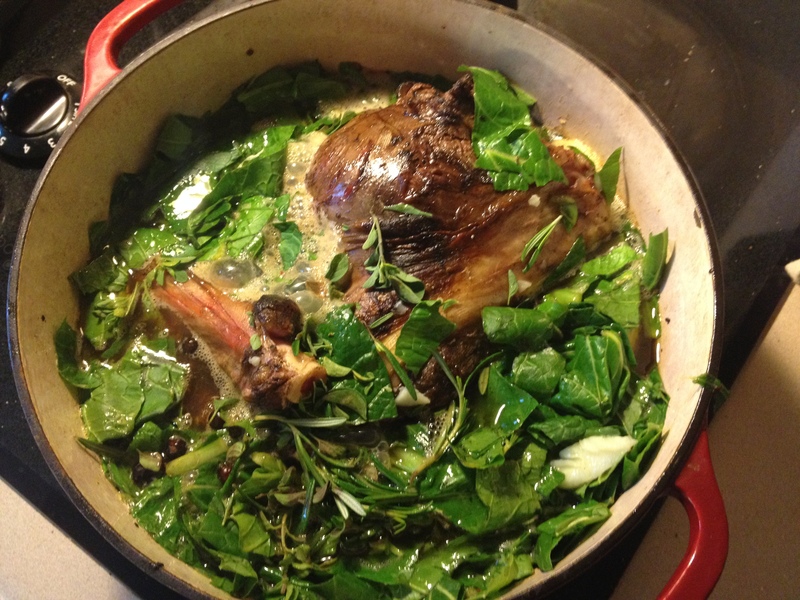 I then added the browned shank to the pot, poured in a quart of venison stock (including some rendered venison fat), 1 beer (ale), mustard greens, rosemary, oregano, and a few juniper berries. Brought the liquid to a near boil, reduced to the lowest simmer (many crock pots are actually a little too hot to do this correctly), put the lid on and let it simmer for 6-7 hours. About an hour before dinner, I added some sweet potatoes and then added some sauteed mushrooms just before serving. The whole thing came out very satisfying and rich. You just can’t beat shank meat. 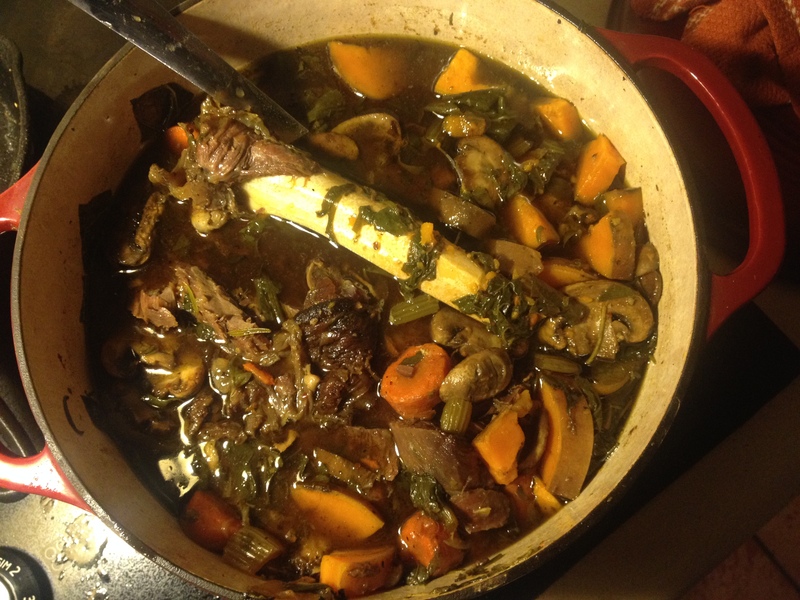 This entry was posted in Cooking, Deer, Deer hunting, News and tagged #game, #Juniper, braise, Carnivore, cook, cooking, crock, Deer, dutch, go, greens, Hunting, ingredient, meat, mushrooms, oven, pot, potatoes, processing, recipe, Shank, slow, sweet, Venison, Whitetail. Bookmark the permalink. More sage advice and solid prep amigo. And thanks for the admonition about slow cookers. Another pet peeve. They have a place in any cooks repertoire but so many buy into the set it, and forget it mindset.